Brussels sprouts resemble mini cabbages, which makes sense as they are a member of the cabbage family. They are high in several vitamins and other important nutrients, as well as dietary fiber -- a major contributor to healthy digestion and elimination. 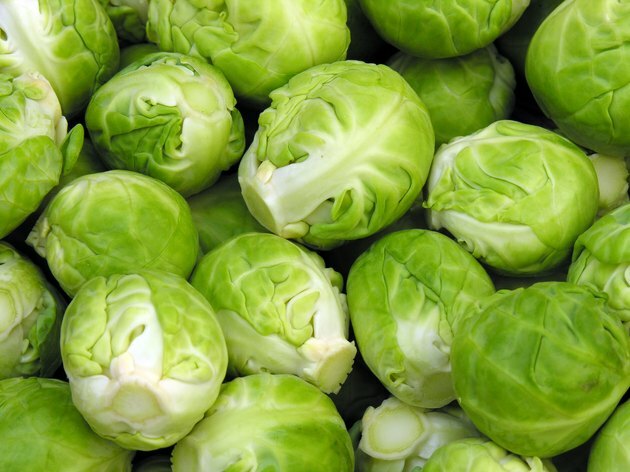 For some people, however, brussels sprouts can be hard to digest, which can lead to gas. Taking a supplement that either helps reduce gas in your intestines or helps digest brussels sprouts can often eliminate that problem. If, however, you continually experience digestive problems with brussels sprouts, consult a doctor. Brussels sprouts are rich in protein, potassium and folate, as well as vitamins A and C. They also contain antioxidants, which can help protect your cells, and omega-3s -- an essential component in controlling inflammation. Brussels sprouts are high in fiber, too -- 1 cup contains about 4 grams of dietary fiber -- which contributes to a healthy digestive system. Children and adults need 20 to 30 grams of fiber every day, according to the Harvard School of Public Health, which means 1 cup of brussels sprouts provides approximately 13 percent to 20 percent of your daily fiber requirement. Fiber helps make your stool bulky, which creates smoother digestion and helps prevent constipation. It can also help make you feel fuller faster, as it doesn't break down in your digestive tract, which can help control hunger and maintain healthy blood-sugar levels. The fiber in brussels sprouts that can benefit your digestive tract can also lead to gas and bloating, particularly if you don't consume much fiber. Fiber doesn't break down in the small intestine, so it gets passed down to the bacteria in your large intestine. This can cause a lot of gas if the bacteria aren't used to breaking down fiber. Brussels sprouts also contain a sugar called raffinose. Humans don't have the necessary enzyme to break down raffinose, which can also cause gas in some people. Brussels sprouts can be a healthy addition to your diet, but if you have problems with gas, it might cause you to quit eating them. This isn't necessary, however, if you take the proper preventative measures. If you are just starting to add fiber to your diet, limit the intake to several grams a day, gradually adding more each day over several weeks. This can give your body time to get used to the additional fiber. Taking a supplement that contains the enzyme alpha-galactosidase can help break down raffinose, and taking a supplement, such as simethicone, that helps reduce gas in your intestines may also help. If problems continue, consult a doctor to rule out a digestive issue.